Not that many college-age kids give a flying cod piece but this year marks the 500th anniversary of the coronation of English king Henry VIII. I know. Exciting stuff. You can barely withstand your exhilaration, I can tell. I happen to be a long-time fan of Henry Tudor and his various achievements. He’s best-known for being a turkey leg-eating, wife-beheading womanizer who was a strict Catholic one minute and an anti-papal bad boy the next. But despite his bad reputation, some historians want King Harry to be bestowed with the title of “Henry The Great” (and not just because of his size). And what better time to give Henry the title than this? But what’s so “great” about this guy anyway? He’s been dead for, like, a million years. Why is his story still relevant? Henry had his faults, especially when he was older. But compared to his royal contemporaries, he was a chivalrous romantic, inspired by whimsical tales of King Arthur and his court. He divorced his first wife, a Spanish princess, to marry someone he was in love with, something that no other English king had ever done. His second wife, Anne Boleyn, was executed on charges of adultery that were almost certainly false. His third wife died in childbirth and his fourth wife, a German princess, agreed to a divorce and lived wealthy for the rest of her life. Henry’s fifth wife, a 16-year-old, was executed for adultery (but at least this time, the charges weren’t so fake). His son, Edward VI, died of tuberculosis when he was a teenager. His daughter Mary burnt hundreds of Protestants and earned the title ” Bloody Mary”. However, his daughter by Boleyn, Elizabeth I, is known as one of the greatest monarchs in history. One of Elizabeth’s greatest victories was the defeat of the Spanish Armada. It was her father who poured so much money into the impressive English navy. Henry VIII was able to divorce his wives because he (and his councillors, many of whom helped Henry along his path to greatness) simply changed the law. He was born a Catholic but rejected the Pope’s wishes, named himself Head of the Church of England, divorced Catherine of Aragon and married Anne Boleyn. I don’t know about you, but risking purgatory so you can marry the woman you love is a bit romantic, isn’t it? Henry continued searching for the perfect queen until a few years before his death, a wife who would deliver him a healthy son who would carry on the Tudor family tree. His final wife, Katherine Parr, acted as nurse and companion when Henry was bed-ridden and far too ill to conceive. Henry VIII died in 1547. During his life, he was a patron of the arts and the first English monarch to authorize an English-language Bible. By separating England from the power of Rome, Henry instilled a sense of identity and pride in his people. He may not have been the perfect ruler, it’s true. But any fan of English history can tell you there’s no such thing and no such person. If Henry was anything, he was one of the more human of all the English monarchs. And definitely one of the most interesting. 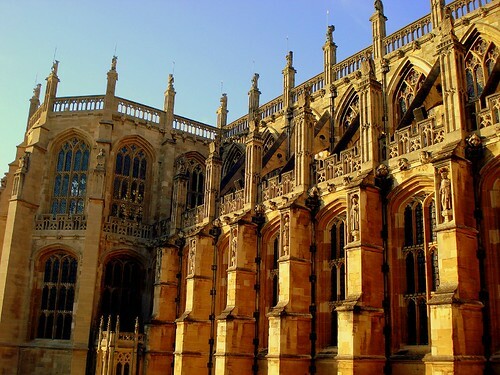 Courtesy of Simbolism on Flickr (Click picture) St Georges Chapel Windsor - Henry's burial place. For many people, the song ‘Greensleeves’ is associated with the Tudors, England and with traditional English music. If the hit counters on ‘YouTube‘ are any guide it is still popular, the version above has been watched over 25,000 times whilst another has had over a million hits! There is a persistent myth that Greensleeves was composed by Henry VIII for his lover and future queen Anne Boleyn. Anne rejected Henry’s attempts to seduce her and this rejection is apparently referred to in the song, when the writer’s love “cast [him] off discourteously.” However, it seems Henry did not write Greensleeves, which is probably an Elizabethan tune. Let the sky rain potatoes! Let it thunder to the tune of ‘Greensleeves’! I like the idea of the sky raining potatoes! These allusions suggest that the song was already well known at that time. No-one really knows who wrote Greensleeves but we do know that music played a huge part in Tudor court life. Dancing was a form of exercise enjoyed by the royal family and practised every morning. Dancing was accompanied by the Court musicians. Low born but talented musicians sought places at the court of the Tudors, and one such musician, Mark Smeaton, featured strongly in the tragic story of Anne Boleyn. Favoured by Anne Boleyn he was falsely accused of being her lover, tortured and finally put to death. The Tudor period was a rich time for music making – and I play and listen to music which would have been familiar to Tudor ears. Music and dancing were at the heart of life for rich and poor alike. The medieval music of the pipe and tabor was still very much in evidence, and many tunes that were played then are still used for English Country Dancing and Morris Dancing. I know many of these well as I play the melodeon for dancing. New instruments were being developed during the Tudor period; and the religious turmoil of the age acted as a stimulus for the music of Tallis, Byrd, which will be the subject of a future post.